Jeff and Bobbe have a Tolkien mindset tempered and lightened by a Midwestern practical sense of humor. A "Final Touch," "Last Minute Detail," and "Night Before Christmas," gathered around the Holy Family, "Flake and Friends," and "Snow Buds" drop by together with "Christmas Slumber Party." And here is fly-by-night "Holiday Goose" on skates. Will she stop and stay? Ask your child. Who else can understand the enchanting and bewitching world of the Schuknechts? 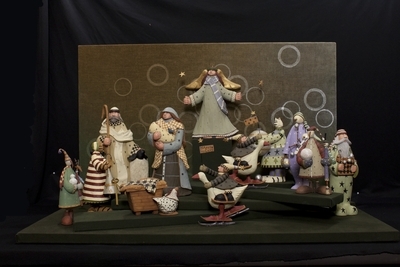 Resin figures sculpted and painted by Bobbe and Jeff Schuknecht in 2004 in the United States, depicting the nativity of Jesus. Exhibition label originally written by Fr. Johann G. Roten, S.M. for exhibit entitled "At The Manger" and held at Roesch Library, University of Dayton.